The new partnership unveiled on 01-Oct-2012 between low-cost carriers Scoot and Tiger Airways is an overdue but critical step in the evolution of the Singapore Airlines (SIA) Group. The group is betting that aligning its long-haul and short-haul LCC brands will improve the profitability and growth prospects for both carriers. While Scoot has been open to connectivity since its inception, Tiger has made a major shift in strategy to accommodate this connectivity. SIA, however, remains adamant that it should maintain complete separation with no transfer of passengers between its two low-cost brands and two full-service brands (Singapore Airlines and regional subsidiary SilkAir). This conservative strategy could end up backfiring as it goes against the successful formula used by other airline groups such as Qantas. Scoot is also evaluating smaller widebody aircraft that will allow it to open more destinations than it can with its present fleet of Boeing 777-200s. For Tiger, working with Scoot should unlock important new growth opportunities in a market that is now approaching saturation. For Scoot, the tie-up is even more important as feed is typically a critical component of the low-cost long-haul model. The Tiger partnership should improve the performance on some of Scoot’s existing routes and open up new routes that would not be viable without feed. But Scoot will need a more robust partnership with Tiger (initially only three Tiger and two Scoot destinations are covered) and smaller widebody aircraft if it is to pursue significant and profitable growth. While it only launched services in Jun-2012, Scoot is already starting to run out of potential destinations that can be profitability served with its fleet of 402-seat 777-200s. Scoot has limited network expansion opportunities due to a variety of reasons including regulatory restrictions, airport limitations and limited market size. The combination of smaller aircraft and feed from other carriers could change the dynamics and open up a significantly larger number of viable routes. There are several potential markets, such as Sapporo in Japan, which Scoot has ruled out viewing them as too small to support 400-seat aircraft flying point-to-point. Even with feed from Tiger and potentially other carriers, such markets would be better served with smaller widebodies such as the 787. Markets where there are regulatory restrictions such as South Korea, which Scoot is not currently looking at because there is insufficient room in the bilateral to support more than three weekly flights, will gradually open up as bilaterals are expanded or open sky agreements forged. When such markets open up, Scoot will be better positioned to respond if it has smaller aircraft and feed. Smaller aircraft will also help access markets where Scoot had encountered airport limitations, particularly some secondary destinations in India or China. Scoot has found that some airports it is interested in serving were built to handle widebodies as big as 777s but in reality cannot at this point accommodate a 777. Smaller widebody aircraft are not only a better fit for such markets from a demand perspective but in some cases are the only options for accessing attractive new destinations. The SIA Group strategy for the key growth markets of China and India is to use Scoot to open up new rather than existing destinations. As the SIA Group is not keen on allowing Scoot to operate alongside SIA or SilkAir in China or India (the two long-haul brands operate side by side in Australia, Taiwan and Thailand), secondary destinations in these markets are critical components of Scoot’s network strategy. Smaller aircraft and significant feed from Tiger are essential if SIA is to effectively use Scoot to open up new destinations in China and India. Scoot is expected to select, within the next year, a smaller widebody type, with Airbus A350s and Boeing 787s to be considered along with A330s as a potential interim solution. Scoot has not yet launched a tender for new aircraft but is keen to conduct formal evaluations over the next several months. Once Scoot selects a new aircraft type the SIA Group will determine whether it is best for Scoot to tap into SIA's existing orders and options or place a new order. SIA has 20 A350s and 20 787s on order although it is the options the group holds for both types that could be most useful for Scoot as SIA already has plans to use its firmly ordered A350s and 787s for renewing its existing mainline fleet. While Scoot is eager to make clear it is a separate airline from SIA, Scoot's aircraft selection will likely be more of a fluid discussion with SIA. But if the group determines Scoot can get the best deal by placing a new order it will not hesitate to go down that route. SIA also operates a new fleet of leased 19 A330-300s with 15 additional leased A330s to be delivered over the next three years. The leases on some of these A330s could be extended beyond the initial six-year terms and shifted over to Scoot as they are replaced at SIA mainline with A350s and 787s. A330-300s are only slightly smaller than 777-200s but they are significantly lighter and would provide a significant improvement in unit costs for Scoot over its less efficient 777-200s. AirAsia X for example configures its A330-300s with 377 seats, a mere 25 seat difference to Scoot's far heavier 777-200s. It is no coincidence that the A330 has come to dominate intra-Asia long-haul sectors, especially to Australia. A350s and 787s could be expected to do the same. Scoot now operates three ex-SIA 777-200s and plans to place into service later this month its fourth 777, which also has exited the SIA mainline fleet. The SIA Group originally outlined last year in a tender for in-flight entertainment and seat power systems plans to retrofit 14 777-200s for Scoot by the end of 2016 (see Background Information). But Scoot has awarded its contracts so that it has options for but is not committed to reconfiguring all 14 aircraft. The SIA Group has flexibility to sell the additional 777-200s now tentatively earmarked for Scoot should Scoot decide it would like to transition to another aircraft type. However, it is unlikely Scoot will transition to a new aircraft type within its first two years of operations. Scoot will almost certainly take at least one of the two additional 777-200s it is now earmarked to receive in 2013, most likely in May-2013 (in time for the June peak travel period in Singapore). Scoot needs to make a decision within the next few months on whether to exercise its options for the two 777-200s which were originally earmarked for delivery 2013 or ask the SIA Group to instead sell the aircraft on the open market. This decision will hinge partially on the performance of Scoot's initial six routes and what opportunities open up in the potential new markets Scoot is now evaluating. Scoot launched services on 04-Jun-2012 with a daily flight from Singapore to Sydney. It added five weekly flights on 12-Jun-2012 between Singapore and the Gold Coast. A daily Singapore-Bangkok flight was launched on 05-Jul-2012 and a four times per week service from Singapore-Tianjin was added on 23-Aug-2012. Singapore-Taipei was the most recent route addition, launching on 18-Sep-2012 with three weekly flights. On 29-Oct-2012 Scoot plans to upgrade this service to daily and extend the route to Tokyo Narita. Shenyang and Qingdao in northeast China will be launched on 27-Nov-2012 with three weekly flights on a Singapore-Shenyang-Qingdao-Singapore triangular routing. This sixth route will give the carrier three destinations in China and nine overall. Shenyang and Qingdao will be the last two destinations it will launch in 2012, completing the first phase of the carrier’s development. Scoot’s initial four-aircraft fleet will be fully utilised once Shenyang and Qingdao are launched. Scoot plans to use its four 777s an average of almost 16 hours per day, a high figure but slightly below AirAsia X's rate of over 17 hours for its A330s. The possible fifth and sixth aircraft, if delivered in 2013 as originally planned, could be used to enter new markets (it has discussed the possibility of entering next year Melbourne along with other potential markets). But the aircraft could also entirely or partially be used to increase frequencies in some of its nine existing markets. Scoot could struggle to meet its aim of serving all its initial routes daily, particularly in the key China market, without significant feed and smaller aircraft. China is not included in the first phase of the Scoot-Tiger partnership, which was announced on 01-Oct-2012 following the signing of a memorandum of understanding between the two carriers. So far the Scoot-Tiger partnership only includes Scoot’s two Australian destinations and three Tiger destinations in Southeast Asia: Ho Chi Minh City in Vietnam, Kuala Lumpur in Malaysia and Phuket in Thailand. Sales of single tickets for combined Tiger-Scoot itineraries began in Australia on 02-Oct-2012 for travel from 15-Oct-2012. Ticket sales for itineraries originating in the three Southeast Asian destinations are slated to go on sale starting 02-Nov-2012. A major limitation in the partnership is the inability to offer same day connections from Sydney to Ho Chi Minh or Phuket and to Kuala Lumpur on most days of the week. Currently Scoot's Sydney flight arrives too late in Singapore (19:00) to connect with the last Tiger flight to these and most other Southeast Asian destinations. Scoot may have to consider re-timing this flight to provide better connections with Tiger. The Gold Coast flight arrives in Singapore earlier, at 15:00, and on the outbound legs both services depart at night, allowing for ample connections. Scoot's Singapore-Sydney service was timed to ensure it would not overlap with SIA's mainline services, thus limiting possible cannibalisation of SIA. Now Scoot and SIA must decide whether it is best to firewall SIA in Sydney or adjusts Scoot's schedule to facilitate connections – increasing profitability – but at the possible expense of cannibalisation. But AirAsia and Jetstar would still offer some advantages with their connecting product. By having short-haul subsidiaries in foreign countries, those carriers can depart the long-haul unit's country later, opening more connecting opportunities. Scoot, for example could find it difficult to connect with a destination like Hong Kong as the Tiger aircraft must depart Singapore early enough to return that night to avoid layovers. The Jetstar Group, however, could have a Jetstar Hong Kong aircraft depart Singapore later in the evening as its rotation would almost be complete. AirAsia offers similar advantages with its subsidiaires. Tiger's only Asian subsidiaries, in Indonesia and the Philippines, are small, and Indonesia is close enough that short flight times do not impact connectivity as much as further destinations such as Hong Kong. Initially passengers will have to clear immigration in Singapore, collect their bags and re-check in for their second flight. This is the same process Tiger passengers who buy the carrier’s existing multi-sector product (for Tiger-to-Tiger connections) now go through in Singapore. But Tiger and Scoot expect to eventually offer a direct connection product for their connecting passengers with their bags being checked through to their final destination, a service offered by peers AirAsia and Jetstar. For Tiger, introducing a real connection product represents a major change of strategy that has been over 12 months in the making. While Tiger cites its 25-Sep-2012 move from the Budget Terminal to Terminal 2 as allowing it to pursue partnerships (Scoot operates from T2), the biggest driver was a strategic decision to abandon the pure LCC model that it had strictly adhered to through the first six years of its existence. Tiger’s former management team, led by longstanding group CEO Tony Davis, had no interest in pursuing partnerships with other airlines as they feared such arrangements would add too much cost and complexity – which do get added, but as AirAsia and Jetstar have found, with yield improvements that offset the costs. Under Mr Davis, Tiger pursued a pure LCC model and avoided following other LCCs in hybridising, part of a stripped down model that included limited advertising and brand development, unlike AirAsia and Jetstar. Tiger started re-evaluating its model, particularly its approach to partnerships, after Mr Davis left in mid-2011 (following the Tiger Australia grounding) and was replaced with acting CEO Chin Yau Seng. At about the same time, former SIA chairman Joseph Pillay was appointed Tiger’s chairman. The appointment of Mr Pillay and Mr Chin were seen as a move by SIA Group to increase its involvement in the management of Tiger, which is 33% owned by SIA. Mr Pillay has been very hands on over the last 15 months in leading change at the struggling LCC group and has spent significant time working out of Tiger’s headquarters near Changi Airport. Mr Pillay along with Mr Chin, who recently returned to SIA and has been replaced by new Tiger Group CEO Koay Peng Yen, implemented several strategic changes. Perhaps the most significant of these changes was the change in Tiger’s approach to partnerships and connectivity. Mr Chin acknowledged Tiger had some catching up to do as it has fallen behind other LCCs that have embraced connectivity in recent years. Tiger rival Jetstar, for example, earlier this year revealed that its portion of traffic at Singapore Changi that is transit had grown from 5% in 2009 to 14% in 2011. Changi Airport, in awarding Jetstar its Partner of the Year award in May-2012, said the growth in Jetstar’s transit traffic was a result of Jetstar actively promoting Changi transfers within the Jetstar Asia network (for example connections from Indonesia and Malaysia to China) as well as interlining partnerships with several carriers including its parent Qantas, Air France-KLM and India’s Jet Airways. Tiger, Scoot and SIA Group are keen to replicate some of Jetstar’s success in using Changi as a transit hub for budget passengers. Until now Tiger relied on self connections that – unlike Jetstar’s more actively promoted transfer product – required passengers to clear immigration in Singapore and recheck their baggage. As a result Tiger has traditionally had a very low number of transit passengers. A more robust transit product for Tiger-Tiger and Tiger-Scoot connections should unlock new growth opportunities for Tiger as the carrier has traditionally relied almost entirely on the point-to-point market. Scoot should also immediately benefit from the feed Tiger will be providing for its Australia routes. While Sydney is unique in that it is a large enough market to support 400 low fare seats per day from Singapore without feed, the feed from Tiger should help Scoot boost yields and ensure the long-term viability of its launch route. On the thinner Gold Coast route, the feed from Tiger should also help boost yields and support a possible upgrade to a daily frequency. Competitors on the Singapore-Sydney route – SIA, British Airways and Qantas – have not yet matched Scoot’s fares and will be unlikely to do so given the sharp difference in product. While Scoot is the only carrier linking Gold Coast with Singapore, the carriers linking nearby Brisbane with Singapore (SIA, Emirates Etihad and Qantas) have not matched Scoot fares. AirAsia X and Jetstar also have not matched Scoot's fares for one-stop alternatives. Initial load factors on Scoot’s Australia routes have been high. Over the first two months Scoot recorded an average system load factor of 79% (based on how quickly the carrier transported its first 100,000 passengers, a milestone it reached on 13-Aug-2012). But Scoot’s initial pricing strategy has been to pursue high loads at the cost of yields, hoping the low fares will help it quickly build up brand exposure. For now its break-even load factor is clearly well above 100%. Scoot's average load factor for its first two calendar months of operation was 78%, consistent with the 79% figure for services through 13-Aug-2012. Outbound Australian passengers comprised 56% of passengers in Jun-2012 but dipped to 47% in Jul-2012, with little variation between Scoot's Gold Coast and Sydney routes, according to data from Australia's BITRE, available through Jul-2012. 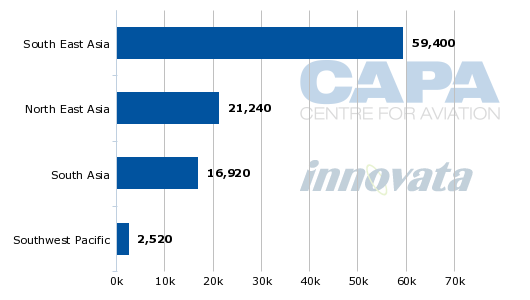 Cargo is becoming the quiet achiever for LCCs, and long-haul LCCs in particular. SIA Cargo is marketing Scoot's belly capacity. Scoot on average carried an admirable 6.2 tonnes of cargo (excluding mail) on each Australian flight in Jun-2012, according to BITRE data. Jetstar on average carried 3.7 tonnes of cargo per Australia-Singapore flight, although this is weighed down by the inclusion of flights on A320s with little cargo room. Jetstar's cargo uplift between Australia and Thailand, served only on A330s, averaged 5.4 tonnes per flight. AirAsia X carried 4.38 tonnes per flight between Australia and Malaysia, which is a smaller average than Scoot, reflecting SIA Cargo's strength to independent AirAsia X. AirAsia X carried 985.9 tonnes of cargo in Jun-2012 to Scoot's 482.6. Legacy carriers typically outperformed Scoot on Australia-Singapore services, with Qantas averaging 12.1 tonnes of cargo per flight and SIA 11.4, although this includes dedicated freighter services. British Airways carried only 1.9 tonnes while Emirates carried 8.2 tonnes between Singapore and Australia, although this too includes (limited) dedicated freighter services. (Heavyweight Cathay Pacific, with numerous dedicated freighter services, averaged 21 tonnes per flights.) As is typical for the market, freight from Singapore to Australia was far larger in weight than freight from Australia to Singapore. The first top-level indication of how Scoot is performing financially will come in Nov-2012, when the SIA Group reports its results for the quarter ending 30-Sep-2012. For the quarter ending 30-Jun-2012 (1QFY2013), SIA Group reported an operating Loss of SGD12.5 million (USD10 million) for Scoot, but this was primarily driven by start-up costs as Scoot operated revenue services for only 27 days during 1QFY2013. Scoot will need to push up fares on Sydney and Gold Coast to approach break even on its Australia services. In the point-to-point market Scoot will need to gain awareness and stimulate new demand and for its product to gain traction and start supporting higher average fares. Passengers in the first four months of Scoot’s operation have become accustomed to the very low fares across both cabins and may re-consider travelling on Scoot if the fares become higher, although AirAsia X entered Australia with comparably low fares and as it built up its presence increased fares too (average fares for Sydney-Kuala Lumpur, launched in 2012, were significantly higher than route launches in previous years). In order to keep its cabin full as it loses some point-to-point passengers when the inevitable fare increase comes, Scoot will need to start relying more on connecting passengers for its Singapore-Sydney and Singapore-Gold Coast routes. Ho Chi Minh, Kuala Lumpur and Phuket are all big markets for Australia traffic and provide an important first step for Scoot to increase the portion of its Sydney and Gold Coast traffic that originates or is heading to destinations beyond Singapore. All three markets are also of strategic importance because it allows the SIA Group to better compete with its long-haul low-cost competitors. AirAsia X now serves both the Gold Coast and Sydney from its Kuala Lumpur hub with connections on short-haul sister carrier AirAsia Malaysia to several markets including Ho Chi Minh, Phuket and Singapore. AirAsia X has cited Phuket as one of its largest markets for connecting passengers from Australia. But these three markets only represent the start of large potential and Scoot will need to partner with Tiger in more markets to reach its desired level of transit passengers. It is particularly surprising that Bangkok is missing from the initial tie-up. Scoot now serves Bangkok with its own aircraft but has only one daily flight on the route, which with current times means it can only provide convenient through connections in one direction to its Gold Coast and Sydney services. Cooperating with Tiger would allow Scoot to offer its passengers convenient connections in both directions. Tiger now operates 37 weekly flights between Singapore and Bangkok, which is the carrier’s largest route. Scoot has been selling Scoot-to-Scoot connections from Australia to Bangkok as well as other destinations. While the carrier is focused on medium and long-haul routes it made an exception for Bangkok in order to allow it to tap into the big Australia-Bangkok market, a market served directly by rival Jetstar, and to improve utilisation of its fleet. In addition to Bangkok there are several Tiger destinations throughout Southeast Asia that could be appealing to Scoot passengers heading to and from Australia. Tiger currently links Singapore with 15 destinations in Southeast Asia (includes services operated by its affiliates in Indonesia and Philippines). Tiger also serves eight destinations in South Asia (six in India and one each in Bangladesh and Sri Lanka) that could also potentially provide valuable feed for Scoot’s Australia flights. Most of Tiger's South Asia flights depart Singapore in the late evening, allowing for convenient Australia to South Asia connections. Australia-India is particularly a large, growing and under-served market which could potentially grow even faster if stimulated by new low-fare connections. South Asia currently accounts for 17% of capacity (seats) for Tiger Singapore while Southeast Asia accounts for 59% and Northeast Asia 21%. The remaining 3% is allocated to Tiger Singapore’s one Australia route, Perth. In north Asia Tiger serves six destinations in greater China: Guangzhou, Haikou, Shenzhen, Hong Kong , Macau and Taipei. While there is overlap with Scoot on the Taipei route the other destinations could potentially be added to the Tiger-Scoot partnership. The two carriers have complimentary network strategies for China as Scoot plans to focus on northern and eastern China (suitable for its 777s) while Tiger will stick with southern China (suitable for its all-A320 fleet). Scoot could also benefit from expanding the partnership to include Tiger-operated flights on the Australia end. For example, Scoot could open up Melbourne as a destination by connecting with Tiger Australia flights from Melbourne to the Gold Coast and Sydney. But for now Tiger Australia is not included in the partnership with Scoot. A more robust partnership with Tiger Singapore and a partnership with Tiger Australia could also help eventually support the launch of a third Australian destination for Scoot. Melbourne originally was rejected by Scoot as it already well served (by Jetstar, Emirates, Qantas and SIA) but Scoot in recent months has talked about the potential of adding Melbourne in 2013. A partnership with Tiger Australia, which has its main base in Melbourne, could persuade Scoot to enter the market despite the competition from Jetstar. (International-to-domestic connections would be much easier at Melbourne than Sydney, where there are split terminals for domestic and international carriers, and unlike the former arrangement for the Budget Terminal at Changi, no complimentary shuttle bus). Other destinations in Australia for the near to medium-term are unlikely (there is no need to serve Brisbane due to the proximity of the Gold Coast, Perth is already served by Tiger and most of the other potential destinations are too small). But with feed, potentially on both ends, and smaller widebody aircraft other destinations in Australia could become viable for Scoot over the long-term. Cooperation between Scoot and Tiger Australia, depending on level, require regulatory approval from Australian authorities. Any strategic coordination between Scoot and Tiger Singapore for tickets sold from Australia would also require regulatory approval. A more pressing need however would be for Scoot to start working with Tiger on its non-Australian services. While Australia was home to Scoot’s first two destinations, its focus for future growth is on Asia, particularly mainland China. The opportunities for Scoot and Tiger to work in China are huge as Tiger could benefit from Scoot feed as it looks to grow its network in southern China while Scoot can use Tiger feed as it grows its network in eastern and northern China. Scoot could particularly use help from Tiger in its new Chinese markets of Shenyang and Qingdao. These are test markets in many respects for Scoot and the SIA Group as neither destination is currently served non-stop from any destination in Southeast Asia. Scoot’s first Chinese destination is different, Tianjin, as it is considered an alternative gateway to Beijing, although AirAsia X dropped it for Beijing. Feed from Tiger or other partners could be crucial for the Singapore-Shenyang-Qingdao-Singapore route to become viable. If the SIA Group can successfully serve secondary Chinese cities such as Shenyang and Qingdao using their budget brands, Scoot will likely look to accelerate growth with a focus on China – where there are several relatively large and under-served potential markets that are not yet part of the SIA Group network. While Scoot is also keen over the medium to long-term on other Asian markets, China is clearly where the most opportunities are. South Korea for now is not open to Scoot due to bilateral restrictions while India is also not considered a near-term possibility. Scoot was looking at northern India (which would complement Tiger’s extensive network in southern and central India) but there is limited space for Singapore carriers in the Singapore-India bilateral and there is no space for Scoot at India’s main metros. Some secondary markets such as Pune have been looked at but have constraints or access issues that for now cannot be overcome. Scoot also does not see any near-term opportunities in Japan beyond Tokyo. SIA’s other Japanese destinations – Fukuoka, Nagoya and Osaka – are not being considered by Scoot because they are viewed by the SIA group as too small to support two brands. The Singapore-Osaka market is also seen as not big enough to support two long-haul LCCs. Jetstar is already in the Singapore-Osaka market with two daily one-stop flights via Tapei and in Nov-2012 will launch three weekly non-stop flights using one of its three Singapore-based A330s (Jetstar now uses these aircraft to offer low-cost long-haul services from Singapore to Auckland, Beijing and Melbourne). Other Japanese destinations such as Sapporo are seen as too small for Scoot although this could change once the carrier establishes feed and brings in a smaller widebody type. Scoot also for now is not interested in operating non-stop flights to Tokyo. The SIA Group it seems is trying to avoid a potential impact on the SIA brand in the Singapore-Tokyo market, which includes three daily non-stop flights to Narita and two daily flights to Haneda. With its one-stop product via Taipei, Scoot will cater to a different type of passenger. The number of seats available to the Singapore-Narita market will also be limited as a large portion of the capacity on the new Singapore-Taipei-Narita route will be allocated to Singapore-Taipei and the lucrative Taipei-Tokyo market. Scoot-Tiger partnership is logical but is it enough? Scoot is a vehicle for the traditionally conservative SIA Group to tap into a new fast-growing segment of market without impacting its premium-focused mainline business, where opportunities for growth are limited. SIA is keen for Scoot to grow rapidly but also become profitable as soon as possible. Partnering with Tiger is logical as it will provide the feed Scoot needs to grow and overcome a point-to-point market which in many cases is insufficient to fill its 400-seat aircraft. Scoot's management team from the beginning said it wanted to pursue partnerships, potentially with a large number of carriers, and exploit Changi Airport's hub status. At the same time SIA is keen to improve the prospects of Tiger, which has struggled financially and has fallen significantly behind rivals AirAsia and Jetstar in the broader Asian market. 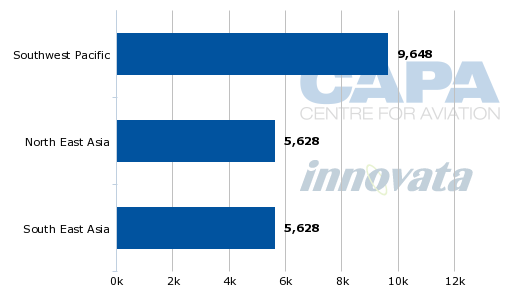 Even in Singapore, AirAsia, Tiger and Jetstar are roughly equal in size with each brand currently accounting for about 8% of capacity at Changi. 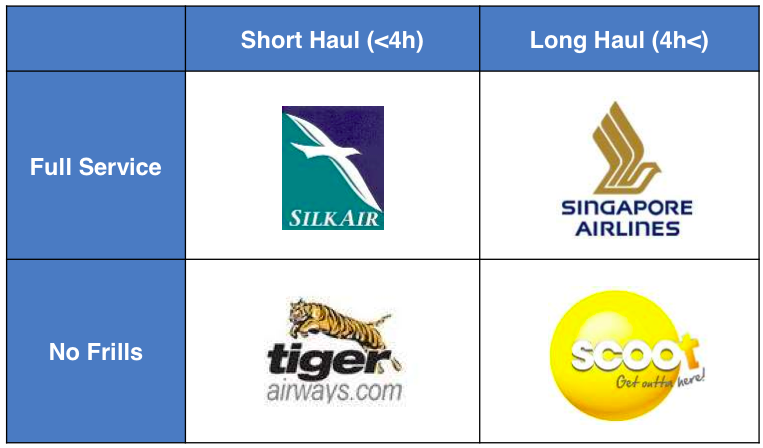 By supporting (and perhaps directing) the recent adjustment in Tiger’s formerly pure Ryanair-esque LCC model to support partnerships and pursue connectivity, the SIA Group is hoping Tiger will unlock new opportunities for growth within Singapore’s short-haul market, which from a point-to-point perspective is approaching saturation after several years of rapid LCC-driven growth. If Tiger is able to grow its transit traffic to the levels of rival Jetstar, the Tiger group may be able to expand in Singapore by 20% without having to try to further grow its point-to-point traffic. Success in these efforts, starting with a partnership in Scoot, would help boost Tiger’s share of the Singapore market. This would in turn push up SIA Group's share of the Singapore market. The SIA Group now has almost a 50% share of capacity in its home market (including 33% for the main SIA brand, 7% for fully owned subsidiary SilkAir, 1% for fully owned subsidiary Scoot and 8% for the affiliated Tiger group). But to fully exploit the opportunities for transit traffic at its Singapore Changi hub, the SIA Group may also need to consider partnerships between its low-cost and full service brands. Such a tie-up would open up new destinations to premium passengers such as Hakiou, Krabi and Macau (which are only served by Tiger) and Gold Coast, Qingdao, Shenyang and Tianjin (which are only served by Scoot). For now SIA does not want to follow rival Qantas in facilitating connections between its budget and full-service units (Jetstar transfers passengers to Qantas, and Jetstar Japan may soon codeshare with part-owner Japan Airlines). In an attempt to protect its premium brand, the SIA Group plans to maintain a wall between passengers that fly SIA and SilkAir and those that opt for Scoot and Tiger. Eventually SIA could be pressured to change this conservative approach.